Three members of Fraser Brown Solicitor’s Nottingham team have been appointed for honorary roles in the Nottingham Junior Lawyers Division (NJLD) to represent, promote and nurture the interests of young lawyers in the county. 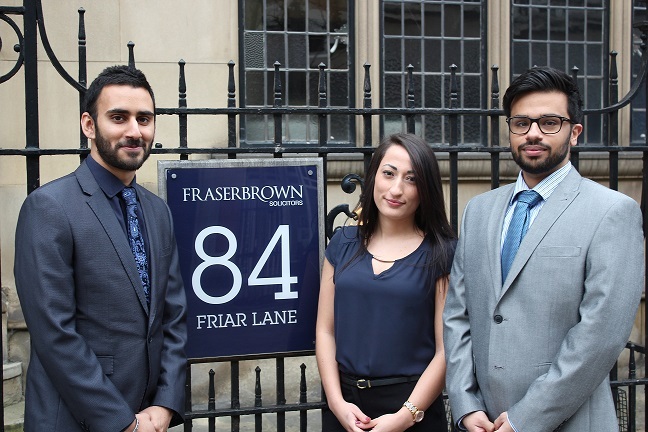 Trainee solicitor at Fraser Brown, Jay Singh, has been appointed as chairman of the division, Tiran Sandhu, a commercial property solicitor has taken the role of vice chair and commercial property paralegal Alicia Yilmaz has taken on the responsibility of student representative. All three will hold their respective roles in the division for the term of one year. The NJLD works to support junior lawyers in Nottinghamshire on the local law society committee and throughout the local business community, providing social and networking opportunities for all young lawyers from the start of their legal careers and up to five years after qualifying as a solicitor. Consisting of a membership base of more than 200 young law professionals, the NJLD is organised by a committee of 16 volunteers from law firms across Nottinghamshire, who are appointed on an annual basis following democratic elections. The division promotes Nottingham as a vibrant legal centre and aims to help lawyers in the county and city centre to cross network with other firms and chambers for professional growth. Having previously served on the committee for two years, Jay, now in his role as chairman, is responsible for the day-today running of the NJLD which includes chairing monthly meetings, leading the committee and promoting the success of the NJLD and the Nottinghamshire Law Society. Tiran has also previously served on the committee for two years and in his current role as vice chair, he will be assisting with the role of chairman, playing a vital part in supporting Jay and the rest of the committee, with a focus on re-establishing a member’s discount scheme amongst local businesses. For student representative Alicia Yilmaz, this is her first year on the committee. As well as taking part in committee meetings, she is responsible for engaging the students within Nottingham who are currently studying Law, the Legal Practice Course (LPC) or the Bar Professional Training Course at university. Being a student herself, she is ideally placed for the role. On his position as chairman, Jay Singh said: “I speak on behalf of all three of us here at Fraser Brown when I say it is a real honour to be in our roles at the NJLD. We aim to give back to the law community and support our fellow young lawyers whenever possible to strengthen the division and open up opportunities for members within the county. “In our honorary roles, we get ample opportunities to meet local junior lawyers and nurture talent in the region. We are able to talk to them about career aspirations, recommend beneficial upcoming events and can provide personal insight into our career paths to help others achieve their goals. “Fraser Brown is incredibly supportive in allowing us to invest time towards our roles in the NJLD and actively encourage us to engage with the organisation. We have in the past held committee meetings at our offices and we are automatically enrolled on a yearly basis with our membership fees being covered by the firm, as well as costs associated with attending events. “Our colleagues take a genuine interest in our roles in the committee and often attend events to provide support, alongside actively promoting what we do internally.